Not that she actually had gone anywhere, but for the first time since her talk show wrapped up in 2011, after 25 years of being in our living rooms five days a week, I was reminded of the energy she exuded each time I sat down at 4pm in the afternoon to be inspired, to be comforted, to laugh and to become informed (oh, and to learn of her new favorite book). 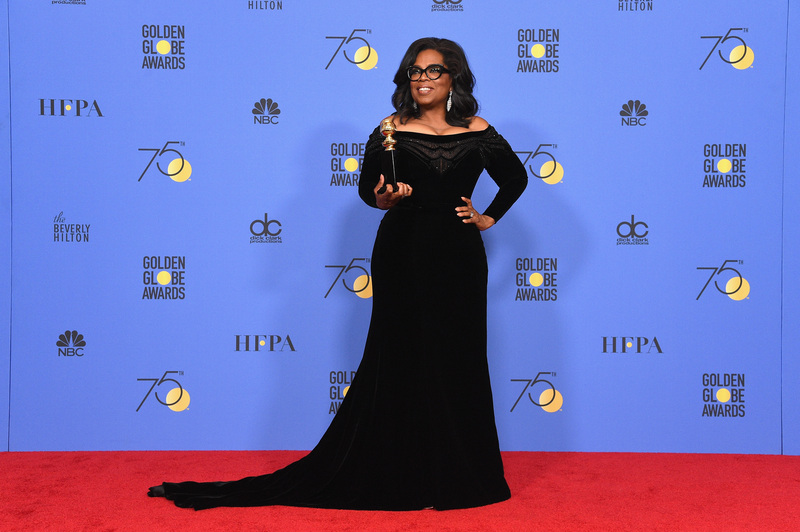 The night at the 75th Golden Globes officially marked for a national audience the shift from recognition of a nation’s ugly truth (the #metoo movement) to an initiative to inspire courage (the #timesup movement) to enable reform. Through the selection of a singular hue, actors (women and men), producers, directors and supporting staff, used their public platform and their traditionally one-dimensional sartorial choices to deepen the conversation. The conversation on the red carpet shifted from what are you wearing to why are you wearing it. What is the purpose? And while some have challenged that the conversation should also have included more discussion about the work that brought the nominees to the award show, many actors and their supporting entourages did indeed dive into their work, the sacrifice, the intention and the message of their films (i.e. Jessica Biel and Justin Timberlake). Waiting in the wings, a humming anticipation was felt amongst those who spearheaded the shift of intent for the evening: What would Oprah say upon receiving the honorary Cecil B. DeMille award? What Oprah decided to say enlivened an integrity starved nation. A voice with resonance, a voice with conviction, a voice with a purpose to lift us all, each one of us – women and men – and remind us of what we each have within us. Equal worth, equal value and the courage to rise when it would be safer (safer for whom? one might ask) to stay seated. Style is introduced to us often as a thing we wear and the sentence stops there. But the truth is style can, and should be multi-dimensional. True style goes beyond the clothing one wears, beyond the make-up and jewelry one dons to “complete” the look. True style isn’t actually about the clothes, but rather about the individual wearing them. Yet in so many of those instances [a rejection of the significance of what one wears to award shows], the outfit is actually an expression, or a reflection, of the action. To ignore it is to miss part of the point. It’s not rising above, it’s turning a blind eye. And hasn’t that, in this case, been the problem all along? Being reduced to what we wear and only what we wear as women or as men is to reduce the potential we have to offer beyond our ability to compose a “Best-Dressed” worthy outfit. How about instead, we choose clothing that exhibits our talents, exhibits what we value, reveals our respect for ourselves and the lives we live and wish to continue to live? Rather than wear clothing for the approval of the world, why not use it to improve the world? Yes, I acknowledge on Tuesdays the Style Inspiration post is shared here on TSLL, but the reason to tend to our style is to further our ability to reach our full potential, and thus to enable the world, the community we live, to reach its full potential. When we choose particular clothing choices, we show intention, we display respect for the occasion, for the opportunity we may receive, and respect for ourselves. Oprah’s style was magnificent Sunday night, and her dress and eye-glasses weren’t that bad either. You can listen to her speech (again) or for the first time below. So well said….thank you Shannon. Agreed, we once again are reminded of her way of striking the right tone and how deeply we miss her presence in our daily lives. Run for president or not, she will always be a first person of the United States. Shannon, what a great post. The entire contents of this post are as enlightening as Oprahs speech. I love “What Oprah decided to say enlivened an integrity starved nation!”. Wow! So very true. Thank you as always for your insight! Completely agree with you. Oh, yes, and her eye – glasses weren’t bad either. I wish that when the rest of the world pictured “Americans”, their minds would reflect on people like Oprah, or perhaps Bill Gates: people who, although they are rich, give back to society. Unlike The Great Cheeto who now “leads” us. With tears in my eyes the only think I can say is that I’m speechless…. what a extraordinary woman an what a speech… In my country, Spain, the last year, 53 women were murdered by her partners, husband, biyfriends.. former husbands… … our fight agains gender violence seems a never ending story.. but we shall overcome..and I feel so proud of all the women around the world that are helping other women to live a better life!! And, sista..this is true style!!! Oh, so wonderful words! An “integrity starved nation” – as a German, I feel with you.